In years past I have meticulously planned my trips, creating day-by-day plans by scouring ride reports and Google Earth, creating daily routes in Garmin Basecamp, then uploading them into Captain Bligh (my GPS). And yet, for all that planning, I was finally forced to admit that not once have I actually followed my route. Part of the thrill of riding solo is the ability to follow whims, to get input from locals, to veer off the beaten track simply to find out where a particular side road went. 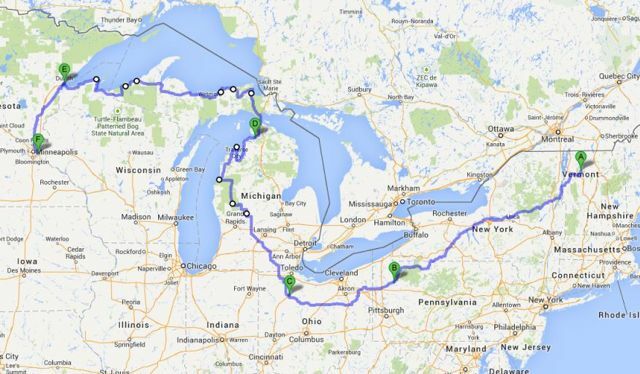 So this year, instead of planning every mile of every day, I planned just a few must see sections – Ohio’s Amish Country, the backroads of Michigan’s Upper Peninsula, and a few rural roads that would allow us to bypass crowded urban centers – trusting to chance to connect the dots. I tried really hard to worry about all the things that might go wrong, but experience told me that Barley and I had already overcome plenty of obstacles in our travels, and that worrying about them hadn’t been much help. Rode with some friends to the UP of Mich. We came in from the direction of your exit route. Rained 8 out of my 10 day ride. Was still fun. There was this fish place in Paradise Mich., so good. Stayed in a motel there and would have loved seeing across the lake but the rain and clouds blocked any view more than 100 yards. After going south over the bridge I went west along the coast through a wonderful tree lined area. I regret now that I didn’t keep better map references so I could find them again. Oh and the bridge… creepy but really cool. It’s a great area to ride, rain or shine. I hope to make it to the New England area this summer. Once I ride those states, New York and north east, I will have ridden all the lower 48 on one bike all in the last 5 years. Fingers crossed. John – The tree-lined area you rode through is probably the Tunnel of Trees (Hwy 119) on Lake Michigan’s eastern shore. On the map you’ll find it on the shore just south of Cross Village and continuing south to Harbor Springs. Nice ride with plenty of rodents to chase! YES! Sweet, thank you. I should have made more map notes. Just curious….why didn’t you take Highway 61 from Duluth along Lake Superior to Canadian border and back down…..best road and camping spots in MN. ? I agree that Hwy 61 was very scenic, we did that on a previous trip (2011). We try to see something different on every trip, and since we’d missed the eastern part of the UP in previous adventures that was the “must see” for this year. 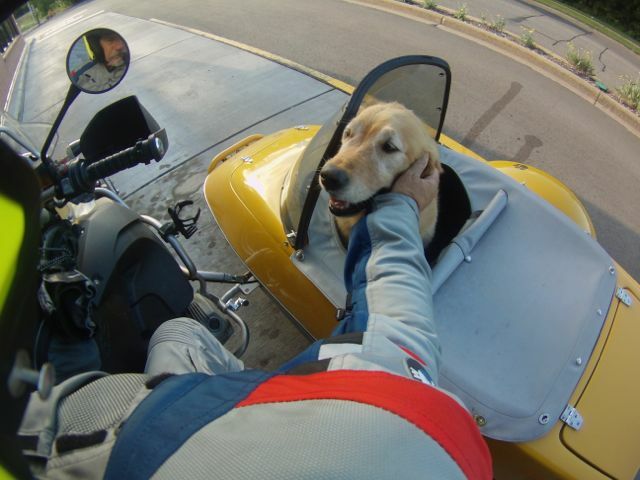 Hi… Have an 85 lb golden, wanting to buy doggles, what size did you buy for Barley? Dave – I weigh 77# and take a large, but I have a blocky head. If you go to Doggles.com you’ll find a sizing chart.